Our newest climbing trail gives riders an easier climb up Buddha Hood to Robinson Road, the trail has just been given the tick of approval for riders to start using and we’d love to hear what you think of it via our Facebook page. Thanks to all that helped put this trail together. A few months ago we were approved to construct this new trail which is rated Black Diamond. The trail will start halfway down Mystic DH, about 50 metres below Hazeldine Road. It comes out onto Robinson Road (near the new climbing trail exit) and leads into last years Nationals Down Hill line. The trail has catch berms, drops and small jumps etc as features. With the bits in between left quite raw, which we are expecting will develop naturally over time. All drainage areas have or will be constructed and adjusted where needed. The name is still to be decided…. but most likely will be called The Pineing or Boogaloo? The trail is currently closed and is still under construction. The trail starts from the road gap down to Hazeldine Road and then joins existing trail 40m below. It travels along the left-hand side of Emily spur. Contains rock gardens, off camber sections, jumps, drops and anything else Pete Ellis could think of… Not for the faint-hearted. Shred Kelly’s Last Stand is now open and the consensus is… it’s bloody awesome!! 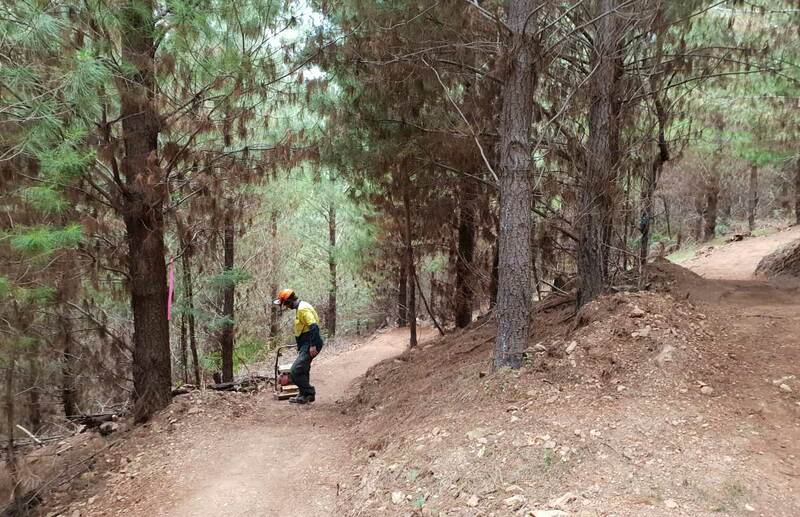 There is a maintenance agreement in the contract, so Garry will be back in the next few weeks to inspect the trail and repair any damage. Trailscapes have kindly given the club a new Rake Hoe as an appreciation for our work with them through the whole construction process. Alia is going to order Flags for the jumps. At this stage we’re still deciding between blue and red flags or yellow and red flags.